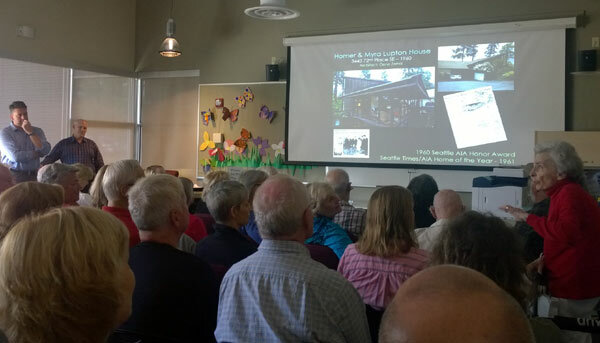 On a beautiful, sunny afternoon the Community Center was packed with over 70 attendees interested in mid-century modern housing of Mercer Island, and what is in place regarding preservation for the many noteworthy examples. First to speak was Chris Moore from Washington Trust for Historic Preservation, who talked regarding national, state, and local landmark preservation programs. In addition he provided charts about local building permits for the last seven years, showing the tear-down history, as well as new construction for single-family, and apartment dwellings. Michael Houser as the audience listens. Next up Michael Houser from the State Department of Archaeology and Historic Preservation, showed many historical then and now images of island mid-century housing, along with a focus on their architects. A copy of his presentation is available for viewing here, along with a handout of Mid-Century houses of note, which may be viewed here. Rounding out the meeting was speaker Todd Scott, from the King County Historic Preservation Program, who spoke briefly on the makeup of the county's program, mentioning which cities had agreements with the county regarding the use of the program. In the Q&A session afterward, a city employee outlined the City of Mercer Island's ordinance regarding preservation.